Our friendly conductors narrate the tour with a fascinating and fun mix of trivia and humorous stories. It will be our pleasure to guide you through “Georgia’s First City” on one of our orange and green trolleys. 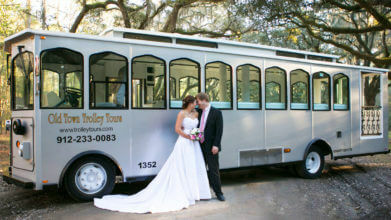 As a resident, I assure you that our Savannah, GA tours are the best way to see the city. Because we cover the entire city, you can avoid costly parking and city driving. We also encourage you to tour at your own pace. Our tour offers on and off privileges, which allows you to hop off the trolley and explore on your own at any time. With frequent pickups at all our stops, this helps you avoid walking long distances. Only sightseeing tour with GPS tracking. Find out when our next trolley is coming, search your nearest stop and more. Learn more about our GPS tours. *Special exemptions apply to the following reservation based attractions: Yankee Freedom III, Boston Tea Party Ships & Museum and Ghosts & Gravestones. Known for its impressive 18th and 19th century architecture, Savannah boasts over 1,700 restored buildings, each with its own story to tell. Travel back to the Civil War era as you visit the Green-Meldrim House, a Gothic revival style building which once served as General Sherman’s headquarters. Nearby is the beautiful Mercer-Williams House, where the controversial events described in Midnight in the Garden of Good and Evil played out. A few blocks further are the Andrew Low House, home to the founder of Girl Scouts USA, Juliette Gordon Low, and the Flannery O’Connor House. For famous Southern cuisine head to Mrs. Wilkes, a boarding house turned family-style restaurant off of Monterey Square. If you’re interested in doing some shopping, City Market and the Bay Street area are known for their quaint shops and galleries. You’ll appreciate the Southern charm and hospitality at every place that you visit. 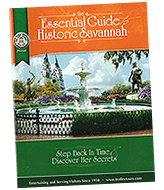 Be sure to stroll through a few of Savannah’s 21 squares, laid out by James Oglethorpe in 1733 and filled with statues, fountains, and lush vegetation. And don’t miss out on Savannah’s newest experience, The American Prohibition Museum – America’s only museum of its kind! Bring back the roaring twenties to life with over 20 intoxicating exhibits & an authentic speakeasy. There’s no better way to see Savannah than with Old Town Trolley Tours. To receive a brochure by mail, go to contact us.